One of the key ingredients in chai tea and spice tea, cinnamon has a delicious, naturally sweet flavor and is one of the oldest known spices. Widely used in cooking and in traditional Chinese medicine and ayurveda, cinnamon is touted as a natural remedy with a variety of health benefits. Despite it's long history of use, cinnamon tea has been tested in very few studies. However, a study published in the Journal of the American College of Nutrition in 2018 found that consumption of a cinnamon extract significantly reduced inflammation and clinical symptoms in people with rheumatoid arthritis. In addition, a small study published in Clinical Nutrition found that cinnamon supplementation led to an improvement in body mass index (BMI), body fat, insulin, and cholesterol levels. A review of previously published studies found that cinnamon consumption was associated with a decrease in levels of fasting glucose, total cholesterol, LDL cholesterol, and triglyceride levels, however there was no significant effect on hemoglobin A1c levels. Place the cinnamon stick in a mug. Add the boiling water and steep the cinnamon stick tea, covered, for 10 minutes. Add the teabag. Steep for one to two additional minutes. Remove the teabag and cinnamon stick. Sweeten to taste, if desired. If you use black tea (either regular or decaffeinated), you can add in warm milk or a dairy-free substitute and sweeten it to taste with honey or maple syrup. Instead of black tea, you can substitute a rooibos or honeybush teabag. If you prefer to drink it without black tea, you can omit the tea bag, however try adding 1 to 2 thin slices of fresh ginger to the cup before steeping for a spicy kick. For an additional flavor boost, add a dash of turmeric and black pepper with the ginger before steeping. You can also squeeze a lemon or lime wedge into the tea. People taking diabetes medication or any medication that affects blood glucose or insulin levels shouldn't take therapeutic doses of cinnamon without first consulting their health care providers. Taking cinnamon together with medication may have an additive effect and cause blood glucose levels to dip too low. Also, people who have been prescribed medication to manage their blood sugar should not reduce or discontinue their dose and take cinnamon instead, especially without speaking with a doctor. Improperly treated diabetes can lead to serious complications, such as heart disease, stroke, kidney disease, and nerve damage. Pregnant women should avoid excessive amounts of cinnamon and shouldn't take it as a supplement. 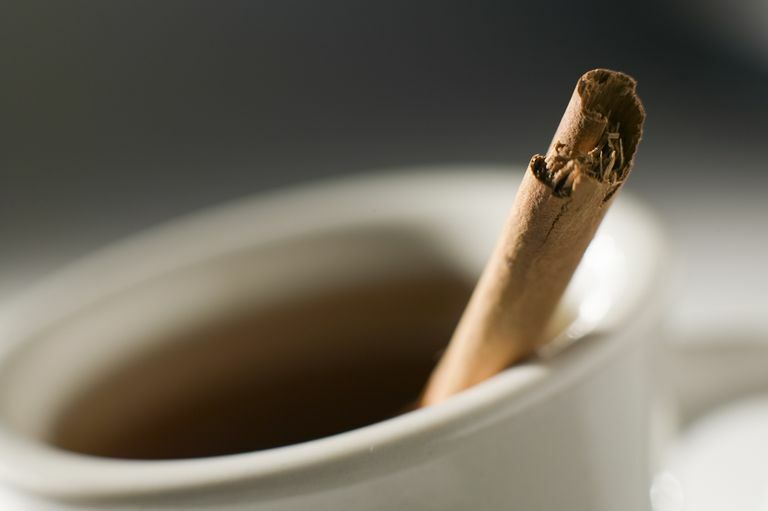 Some people may experience allergic reactions to herbal tea containing cinnamon. Cinnamon has been found to cause allergic dermatitis. Rashes may appear around the mouth and lips (areas that come in contact with cinnamon) or may be widespread on the skin of the body. According to one report, 1000 mg of cinnamon bark powder taken daily was associated with fluid retention (edema) and can possibly worsen congestive heart failure. Despite the lack of evidence that cinnamon tea can improve your health, a cup of cinnamon tea can be a delicious addition to your regular tea rotation. Still, overdoing it can lead to excessive intake of coumarins if you use such cinnamon species as Cinnamomum cassia. If you're unsure of how much you should be drinking, consult your health care provider before adding it to your diet. Shishehbor F, Rezaeyan Safar M, Rajaei E, Haghighizadeh MH. Cinnamon Consumption Improves Clinical Symptoms and Inflammatory Markers in Women With Rheumatoid Arthritis. J Am Coll Nutr. 2018 May 3:1-6. Zare R, Nadjarzadeh A, Zarshenas MM, Shams M, Heydari M. Efficacy of cinnamon in patients with type II diabetes mellitus: A randomized controlled clinical trial. Clin Nutr. 2018 Mar 11.